These numbers are based on costs for the 2018-2019 school year. Amounts will change slightly from year to year, but as the cost of college increases, the scholarship packages will correspondingly increase. Your official financial aid award will be included in a letter directly from Stanford. Outside awards can be used to reduce the Student Responsibility down to zero. Funding in excess of that amount will be used to reduce the Stanford scholarship. Stanford requires all students to have health insurance, either through a parent or another plan. If a student is not covered by a parental plan, the Stanford grant will be increased to pay for the $5,208 Stanford Cardinal Care student health plan. A travel allowance will be determined by Stanford based on family location. Stanford scholarship will be increased for this allowance. Students must be making Satisfactory Academic Progress and submit a complete financial aid application each year as outlined on the Financial Aid website. The Financial Aid Officer will then review the yearly information and create an award based on the updated student budget and family circumstances. Students on Stanford financial aid will receive assistance for other expenses including unreimbursed medical expenses and attendance at Stanford's Bing Overseas programs. At Stanford, you must apply for financial aid for each academic year you plan to enroll. Stanford expects students and their parents to contribute toward educational costs to the extent that they are able. Stanford's financial aid program will make up the difference when families are not financially able to cover the costs. 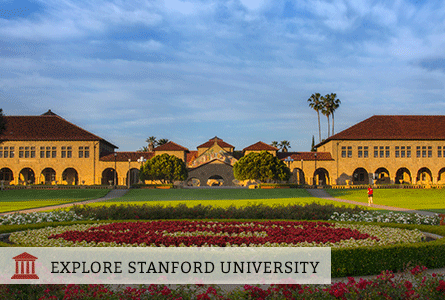 Stanford individually evaluates each application on several factors including family total income, family size, and the number of siblings in college. Stanford will also review any documented special circumstances, such as high medical expenses. Stanford will expect no parent contribution toward educational costs for parents with total annual income below $65,000 and typical assets for this income range. For parents with total annual income below $125,000 and typical assets for this income range, Stanford will ensure that all tuition charges are covered with need-based scholarship, federal and state grants, and/or outside scholarship funds. In most cases, the parent contribution will be no higher than the standard cost of room and board (around $16,000). Many parents in this group will see contribution amounts far lower than $16,000. All students have a Student Responsibility. This Student Responsibility portion of the package can be met with a combination of sources including: employment during the summer and academic year, scholarships from outside the University (e.g., National Merit Scholarships, Rotary Scholarships, etc) or a student loan. Students will also be expected to contribute 5% of their own savings. For most students the total Student Responsibility is $5,000. Families with incomes higher than $65,000 will have an expected parent contribution higher than $0, but with similar Student Responsibility levels. 47% of Stanford students receive need-based aid, with an average award of over $51,614. Learn more. Over $177 million institutional scholarships/grants awarded each year, and 100% of students' demonstrated need is fully met by Stanford. Stanford is need-based and need-blind in its selection of all first-year candidates who are U.S. Citizens, undocumented students, or Permanent Residents. Use Stanford's Net Price Calculator to estimate the financial aid for which you may be eligible.